Birmingham, Ala. (July 26, 2016) – As midnight of 2000 approached and the Y2K panic came to a fever pitch, we all watched to see if the experts were right, if the world’s computers would all simultaneously crash, causing our infrastructure to implode and leaving us in the rubble of useless computers. Companies sprang up to reprogram our IT systems, protecting us from this apocalyptic scenario. And in the dawn of this new millennium, nothing happened. Birmingham, Ala. (July 22, 2016) – In the 2000s, the lifestyle center became the darling of retail shopping. 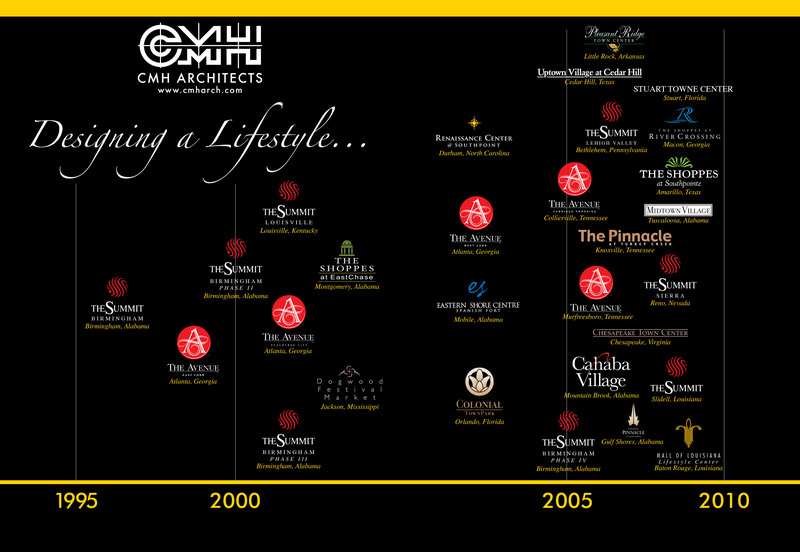 In the years from 2000 to 2008 CMH designed 23 lifestyle centers with a total area of 7.8 million square feet. See chart below to view our major contributions to the rapid rise of this popular shopping venue. Birmingham, Ala. (July 1, 2016) – Before the long Fourth of July weekend, we wanted to introduce one of our new hires: Jeramie Little. Jeramie joined CMH at the beginning of June, and we are grateful to have such an enthusiastic new addition to the family. He took some time to write a little about himself below. Welcome to the CMH community, Jeramie! “I joined the CMH family on June 06, 2016. I am 26 years old and originally from Port Saint Lucie, Florida. I now live in Center Point, Alabama with my wife Emily and daughter Nylah. As a little boy, about age 7, I began to grow an appreciation for art, carpentry and I absolutely loved to play with Legos; to some extent I still do. Since age 7, when I was introduced to the profession of an architect, I knew that becoming an architect was my dream. The thought of art, construction and design being an actual profession motivates me even to this day, because I get to wake everyday happy and excited to practice the things that I enjoy doing most. I received the Bachelor of Architectural Studies (2012) and Master of Architecture (2013) degrees from Norwich University, located in Northfield, Vermont. Norwich University is the first and oldest private military college in the United States of America. While enrolled at Norwich, I played four years of NCAA varsity football and was a starter at the cornerback position. I was fortunate to be a part of a winning team where we became the first team in school history to win a conference championship (2009 season) as well as being the first team to earn a playoff bid (2011 season). In the spring of my junior year, I earned an opportunity to study abroad for a semester in Berlin, Germany. While in Germany, I traveled to Meissen, Dresden, and Potsdam. In addition I traveled to the following neighboring countries: Italy, Hungary, the Czech Republic, and France. Following my return back to the United States, I then traveled to Montréal, Canada hoping to continue my zeal of exposing myself to different theories in architecture. Even though architecture can easily consume me and my time, when I step away from architecture I love to watch sports. I also like to create art (charcoal, pencil, watercolor and oil), fixing things, building things, and watching movies. I enjoy traveling, spending time with family and friends, and I love to seek opportunities to mentor our youth. I am an assistant coach for the Kingston Raiders in Birmingham, Alabama where I also serve as the “Player Safety Coach” representing USA Football and I am a mentor for the ACE Mentor program (Birmingham Chapter). My family and I attend the Avondale Church of Christ located in Birmingham, Alabama where we strive to build our relationship with God and I love to sing gospel music.